For decades, most neuroscientists have believed that memories are stored at the synapses — the connections between brain cells, or neurons — which are destroyed by Alzheimer’s disease. The new study provides evidence contradicting the idea that long-term memory is stored at synapses. The findings were published recently in eLife, a highly regarded open-access online science journal. 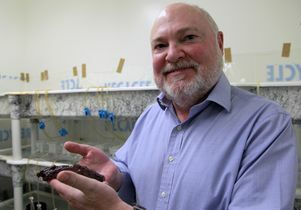 Glanzman’s research team studies a type of marine snail called Aplysia to understand the animal’s learning and memory. The Aplysia displays a defensive response to protect its gill from potential harm, and the researchers are especially interested in its withdrawal reflex and the sensory and motor neurons that produce it. They enhanced the snail’s withdrawal reflex by giving it several mild electrical shocks on its tail. The enhancement lasts for days after a series of electrical shocks, which indicates the snail’s long-term memory. Glanzman explained that the shock causes the hormone serotonin to be released in the snail’s central nervous system. Glanzman’s team found the same mechanism held true when studying the snail’s neurons in a Petri dish. The researchers placed the sensory and motor neurons that mediate the snail’s withdrawal reflex in a Petri dish, where the neurons re-formed the synaptic connections that existed when the neurons were inside the snail’s body. When serotonin was added to the dish, new synaptic connections formed between the sensory and motor neurons. But if the addition of serotonin was immediately followed by the addition of a substance that inhibits protein synthesis, the new synaptic growth was blocked; long-term memory could not be formed. The researchers also wanted to understand whether synapses disappeared when memories did. To find out, they counted the number of synapses in the dish and then, 24 hours later, added a protein synthesis inhibitor. One day later, they re-counted the synapses. What they found was that new synapses had grown and the synaptic connections between the neurons had been strengthened; late treatment with the protein synthesis inhibitor did not disrupt the long-term memory. The phenomenon is extremely similar to what happens in the snail’s nervous system during this type of simple learning, Glanzman said. Next, the scientists added serotonin to a Petri dish containing a sensory neuron and motor neuron, waited 24 hours, and then added another brief pulse of serotonin — which served to remind the neurons of the original training — and immediately afterward add the protein synthesis inhibitor. This time, they found that synaptic growth and memory were erased. When they re-counted the synapses, they found that the number had reset to the number before the training, Glanzman said. This suggests that the “reminder” pulse of serotonin triggered a new round of memory consolidation, and that inhibiting protein synthesis during this “reconsolidation” erased the memory in the neurons. If the prevailing wisdom were true — that memories are stored in the synapses — the researchers should have found that the lost synapses were the same ones that had grown in response to the serotonin. But that’s not what happened: Instead, they found that some of the new synapses were still present and some were gone, and that some of the original ones were gone, too. Glanzman said there was no obvious pattern to which synapses stayed and which disappeared, which implied that memory is not stored in synapses. When the scientists repeated the experiment in the snail, and then gave the animal a modest number of tail shocks — which do not produce long-term memory in a naive snail — the memory they thought had been completely erased returned. This implies that synaptic connections that were lost were apparently restored. Glanzman said the research could have significant implications for people with Alzheimer’s disease. Specifically, just because the disease is known to destroy synapses in the brain doesn’t mean that memories are destroyed. “As long as the neurons are still alive, the memory will still be there, which means you may be able to recover some of the lost memories in the early stages of Alzheimer’s,” he said. Glanzman added that in the later stages of the disease, neurons die, which likely means that the memories cannot be recovered. The cellular and molecular processes seem to be very similar between the marine snail and humans, even though the snail has approximately 20,000 neurons and humans have about 1 trillion. Neurons each have several thousand synapses. Glanzman used to believe that traumatic memories could be erased but he has changed his mind. He now believes that, because memories are stored in the nucleus, it may be much more difficult to modify them. He will continue to study how the marine snail’s memories are restored and how synapses re-grow. Co-authors of the study include Shanping Chen, Diancai Cai and Kaycey Pearce, research associates in Glanzman’s laboratory. The research was funded by the National Institutes of Health’s National Institute of Neurological Disorders and Stroke, the National Institute of Mental Health and the National Science Foundation. Almost all the processes that are involved in memory in the snail also have been shown to be involved in memory in the brains of mammals, Glanzman said. In a 1997 study published in the journal Science, Glanzman and colleagues identified a cellular mechanism in the Aplysia that plays an important role in learning and memory. A protein called N-methyl D-aspartate, or NMDA, receptor enhances the strength of synaptic connections in the nervous system and plays a vital role in memory and in certain kinds of learning in the mammalian brain as well. Glanzman’s demonstration that the NMDA receptor plays a critical role in learning in a simple animal like the marine snail was entirely unexpected at the time.